For quantitative determination of lactose and evaluation of drug effects on lactose metabolism. • Use as little as 20 μL samples. Linear detection range in 96-well plate: 17 to 2000 μM lactose for colorimetric assays and 6 to 100 μM for fluorimetric assays. Lactose (C12H22O11), also called milk sugar, is a disaccharide that consists of β-D-galactose and α/β-D-glucose through a β1-4 glycosidic linkage. Lactose is the major sugar and makes up 2–8% of milk. Simple, direct and high-throughput assays for lactose determination find wide applications. 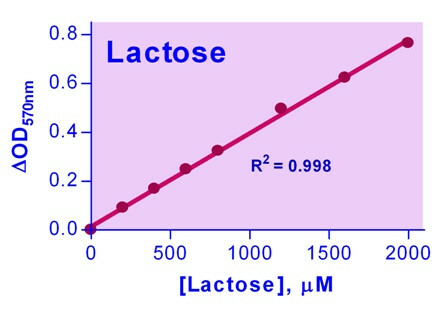 BioAssay Systems’ assay uses specific enzyme-coupled reactions in which lactose is cleaved and the resulting galactose forms a colored product. The color intensity at 570nm or fluorescence intensity at 530nm/585nm is directly proportional to the lactose concentration in the sample. Applications For quantitative determination of lactose and evaluation of drug effects on lactose metabolism. References Assay: Milk in Rats (Pubmed). 2. Vabbilisetty, P and S Xue-Long (2014). Liposome surface functionalization based on different anchoring lipids via Staudinger ligation. Organic and Biomolecular Chemistry 12(8): 1237-44.Assay: Liposomes (Pubmed). 1. Kwon, DH et al (2012). Dietary protein restriction induces steatohepatitis and alters leptin/signal transducers and activators of transcription 3 signaling in lactating rats. Journal of Nutritional Biochemistry 23(7): 791-9. Assay: Milk in Rats (Pubmed).